There is one, pretty well-known fictional example: “Bonzo Dog Food” from Russell Hoban’s 1969 children’s book, The Mouse and His Child. …an empty tin can that stood near the mouse and his child. BONZO DOG FOOD, said the white letters on the orange label, and below the name was a picture of a little black-and-white spotted dog, walking on his hind legs and wearing a chef’s cap and an apron. The dog carried a tray on which there was another can of BONZO DOG FOOD, on the label of which another little black-and-white spotted dog, exactly the same but much smaller, was walking on his hind legs and carrying a tray on which there was another can of BONZO DOG FOOD, on the label of which another little black-and-white spotted dog, exactly the same but much smaller, was walking on his hind legs and carrying a tray on which there was another can of BONZO DOG FOOD, and so on until the dogs became too small for the eye to follow. 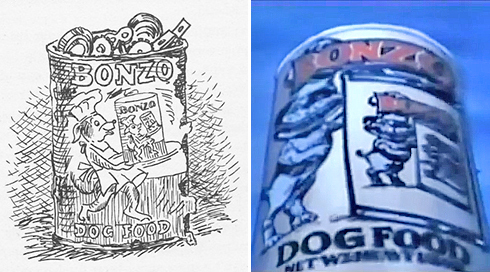 …the dog motif connects all parts of the story: Bonzo, the tramp’s little black-and-white spotted dog resembles the dog on the label of BONZO dog-food cans that are standing and lying around everywhere in the book… The network of references is almost too tightly woven. A motif that is so much foregrounded invites interpretation. Yet, what does this “too-muchness of dogs” stand for? Is it loyalty, as the tramp’s dog suggests? But then the allegory has been anchored in a very threadbare “character”. Or did Hoban think of the idiom “it’s a case of dog eat dog” when he decided to represent infinity by means of a BONZO dog-food label? 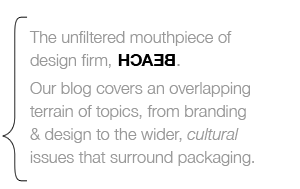 While Hoban’s “Droste effect” dog-food cans may have started out as a metaphor for infinity, they’ve been metaphorically recycled by other writers to represent everything from AIDS research to quantum physics. In Russell Hoban’s allegory The Mouse and His Child, there is an amusing (unintended) metaphor for how Quantum Field Theory works. Sometime during their nightmarish adventure, the toy mechanical mice—father and son—discover an endlessly fascinating can of Bonzo Dog Food. On the label of the can is a picture of a dog holding a can of Bonzo Dog Food, whose label shows a dog holding a can of Bonzo Dog Food, whose label . . . Deeper and deeper the mice peer, in a frustrating quest to see “The Last Visible Dog,” but they are never quite sure that they have seen it. Things inside things inside things—that’s the story of Quantum Field Theory.